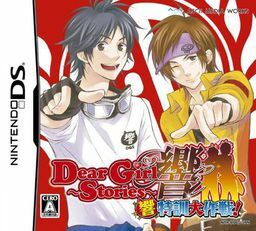 Dear Girl ~Stories~ Hibiki: Hibiki Tokkun Daisakusen! Title Dear Girl ~Stories~ Hibiki: Hibiki Tokkun Daisakusen! Take part in the fun. Dear Girls Stories the top ranking radio show has now become a game. Hiro C and Ono D are here to solve all the ladies' problems. You are the new assistant of these two heroes, design a training menu for them and take them through the mini games. The higher the score, the better they become at the skill. See if your training pays off, listen to the troubles of the girls and send the duo out solve their problems. Take a break in the weekends and spend time with the two cool guys. "He scared me, so I did something scary."